The Terror Trap: What Have They Done to Your Daughters? Part actioner, part crime mystery, the energized and enjoyable What Have They Done to Your Daughters? is director Massimo Dallamano's semi-followup to his 1972 seminal giallo What Have You Done to Solange? 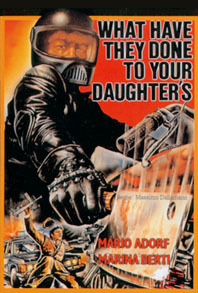 While it may be true that elements of the police procedural subgenre occasionally threaten to dominate the bulk of Daughters, both the sleazy schoolgirl atmosphere and enough giallo conventions remain to ensure that followers of black-gloved slashings will receive their necessary dose of chills. After her photo is published in the newspapers, the dead girl is soon identified as Silvia Polvesi (Cheryl Lee Buchanan). When police video footage of a public protest inadvertently reveals Silvia in a different location at the time of her death, D.A. Stori is certain the girl's death was a murder...the killer must have murdered the girl and then moved her body to her sublet apartment. With the case now transferred to homicide, Inspector Silvestri (Claudio Cassinelli) assumes the reins. Interviewing Silvia's parents (played by Farley Granger and Marina Berti), Silvestri discovers that not only had the girl been seeing a psychologist - but also that her mother had hired a detective to track her promiscuous daughter. However, when Silvia's detective is found hacked and dismembered inside the trunk of his own car, Silvestri turns to the investigator's secretary...could he somehow have been responsible for Silvia's death? No sooner does Silvestri turn to Rosa (Micaela Pignatelli) for answers than a motorbike rider clad all in black (think the killer of Night School) and wielding a shiny meat cleaver begins to silence all those who talk to the police. What silence does the psycho want to ensure? And who is he protecting...? Notable highlights include the murderer's rampage through the hospital hallways en route to deliver a little warning to secretary Rosa. Clearly possessing minimal respect for the sick and infirm, our cleaver-wielding killer decides to add a little more to the pile by cleanly lopping off the hand of a detective. Another standout of Daughters is the killer's extended chase of district attorney Stori through the darkened underground parking lot of her apartment building. Suspenseful and well-shot, the sequence ends with the poor D.A. cornered in an elevator and nice shock as the lift door is shattered. The musical score by Stelvio Cipriani nicely complements the action, the relaxed choir-like "lah lahs" of the opening credits underscoring the assumed innocence of teenage schoolgirls...while the nervous, rapid low tones during the suspense scenes are right on as well. What Have They Done to Your Daughters? is alternately known as The Police Want Help and also The Coed Murders. Italian title: La polizia chiede aiuto.